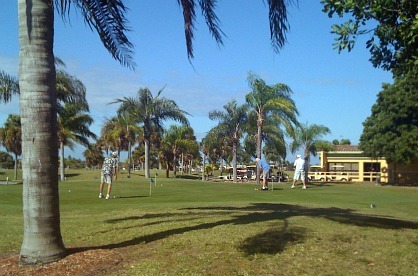 Cape Coral Golf Courses are some of the best in Southwest Florida, so get out in the sun and have some fun! For Cape Coral golf enthusiasts, we have 4 courses ........... Royal Tee, Palmetto Pines, Coral Oaks, and Hunters Ridge Executive Course. They are public or semi-private, each one is a bit different from the other, so you'll want to try them all! We also have a mini-golf course at Mike Greenwells. Wherever you are in the Cape, you only have a short drive for the most part, if you want to get out and play a round ........ the courses are located in the SW, SE, and NW sections of the city. If you really love the game, you may even want to live in a neighborhood surrounding a course, or a golf community, so you can go golfing in your back yard! Royal Tee is the largest semi-private golf course in Southwest Florida and is in the golf community, Cape Royal. It has 27 championship holes, and is one of the nicest golf courses in Cape Coral. Enjoy your game on greens that have rolling terrain, lakes, sand bunkers, and is surrounded by the residences of this golf community. They have practice greens, a driving range, 4 sets of tees, a pro shop, and the Crown Pub. PGA Instruction and clinics are available to help your game. Palmetto Pine has 18 holes in a lovely and peaceful setting of palm trees and pines in a lovely neighborhood ..... I should know, we lived there when we first moved to the Cape! The club is semi-private at the moment, the tees and fairways were refurbished in 2004, and there are 5 sets of tees. They have hosted many prestigious tournaments. Proper attire is required, they have a pro shop and clubhouse with restaurant. 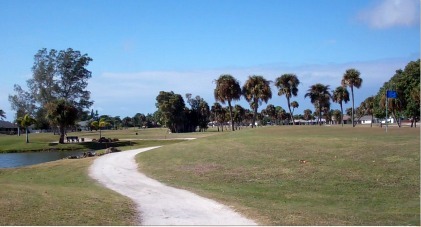 Coral Oaks is city-owned and one of Cape Coral golf courses open to the public. Cape Coral residents get a discount. 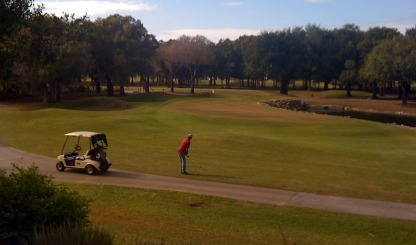 The 18-hole golf course is in an old oak hammock, has lakes and bunkers, and natural surroundings. Private lessons, golf school, clinics, and PGA instruction are available. Shop in the pro shop or go to Knickers Pub for food and refreshments. Proper golf attire is required. 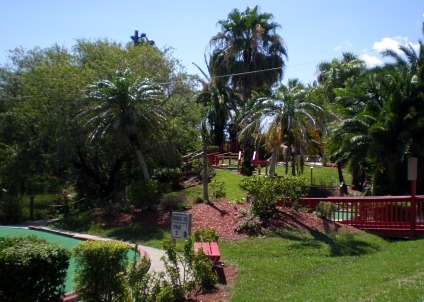 Hunters Run is the smallest of the Cape Coral golf courses, and also a public golf course. Also known as Hunters Ridge, it has an executive length golf course, in other words, it only has 9-holes and a less competitive par for each hole. The course is meant to be played quickly and is usually more affordable. 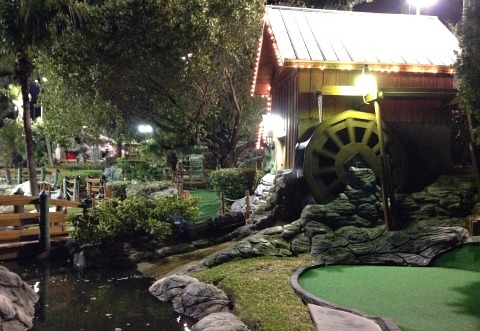 Mike Greenwells is the place to go to for mini-golf and ..... go-carts, batting cages, paintball, arcade, and more. They are open year-round and have free parking. Group rates are available and they also do birthday parties. 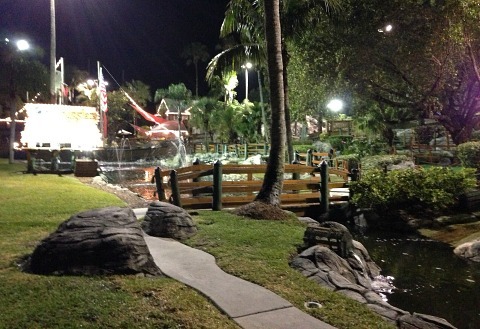 Another place to go mini golfing is at The Shell Factory in North Ft Myers. 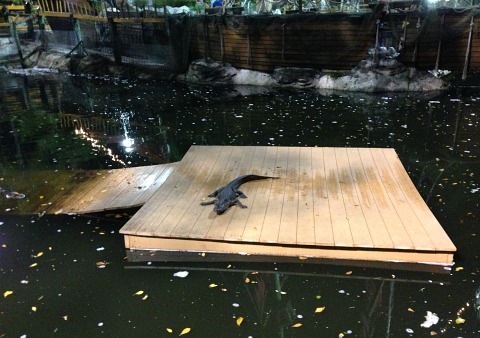 They also have bumper boats, paddle boats, and nature park with real live gators. Our favorite place to go mini-golfing in Ft Myers is Smugglers Cove, on San Carlos Blvd, on the way to Fort Myers Beach. They actually have small alligators in a pool just beyond the entrance. Sometimes they're all piled up on a platform in the middle of the pool. There is a viewing deck where you can watch them and sometimes feed them. Several gators came swimming over to where we were watching them from behind the fence ........... even though it looked safe, we decided it was time to golf! 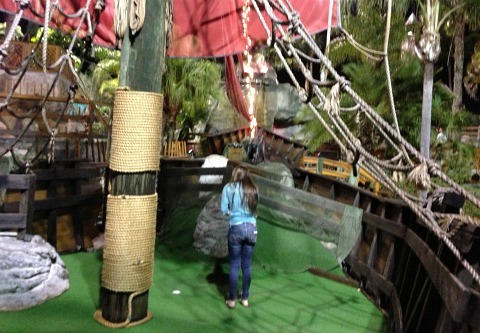 The mini-golf course is fun and challenging with a pirate ship, waterfalls, bridges, and lovely landscaping. You work your way up a hill and then back down again, fortunately there are some shade trees if you go during the day. Burnt Store Golf and Activity Club - This gated community and resort has a terrific 27-hole golf course, marina, restaurant, and homes for vacation rentals or purchase. It's right on the border between Cape Coral and Punta Gorda. Herons Glen - An 18-hole championship golf course is featured in this gated community that also has a country club and recreational facilities located in North Ft Myers. El Rio Golf Club - Also an 18-hole golf course just over the border from Cape Coral into North Ft Myers. If you're used to golfing up north, you may have noticed that your shots may be short down here in Florida. The reason is that you're playing at sea level and in higher humidity ....... which makes the ball fly shorter distances. You may also not be chipping or pitching as well either. The Bermuda grass used for greens in Florida doesn't allow your shots to roll out as much as on northern greens. So, hit a club longer on your iron shots, and play so that the ball won't run out as much on chips and pitches around the greens.